Thank you very much for attending the King County Legislative Forum on November 24, 2014. I was unable to attend and present some information regarding critical needs and access to services for many in our communities but do appreciate the opportunity to share the information with you at this time. With Governor Inslee’s budget proposal it is clear that we will again be looking at more cuts to services for people with Intellectual/developmental disabilities. It is critical to have accurate information regarding community care, respite, crisis care and cost of care in order to make informed decisions. What is most concerning to me is that facts are not being shared regarding access to and cost of care – particularly for the much needed respite and crisis care. I have gathered the information below in hopes of sharing some solutions to the problem. You heard some heart wrenching stories, particularly from Janice Lawrence and Laura Jorgenson regarding lack of respite and crisis care. 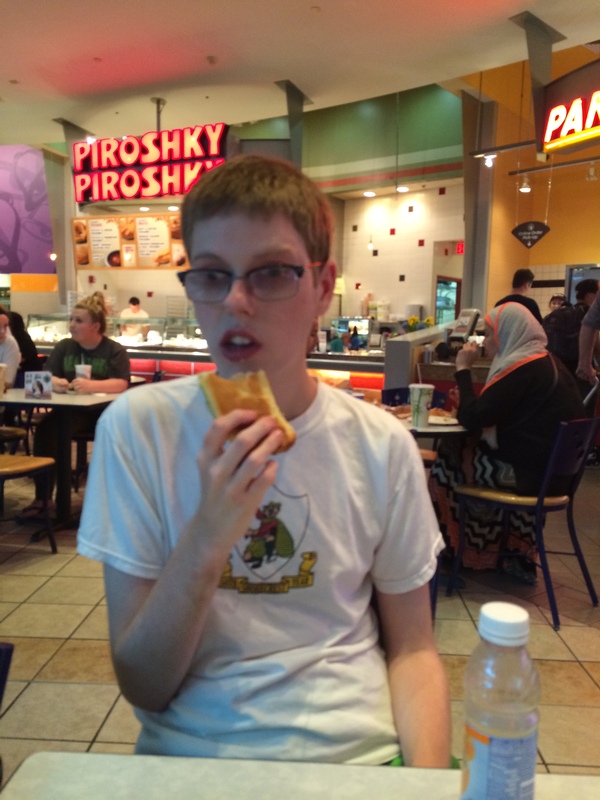 My family, too, has experienced these issues – my son faced jail as the only option left for “care” as a 14 year old with profound intellectual and developmental disabilities. Multiple and prolonged hospitalizations were our crisis care until the denial of services was able to be appealed and he was admitted and stabilized at a Residential Habilitation Center (RHC). I understand the agony of these families in trying to secure appropriate care for their children and I work hard to advocate for this care. You may recall in 2011 our state passed 2SSB 5459. There was quite a bit of controversy regarding this bill for several reasons – mainly closing of the Frances Haddon Morgan Center (FHMC) based on “cost savings” which never materialized and a state law which goes directly against Centers for Medicaid and Medicare Services admission of eligible clients into the Intermediate Care Facility for those with Intellectual Disabilities (ICF/ID) or the Residential Habilitation Centers (RHCs). Washington State passed a law prohibiting those under 21 from admission to the RHC, regardless of choice and eligibility requirements being met. The plan was to open up several crisis care centers for youth throughout the state. This plan was not fulfilled – again for several reasons but mainly because there was NO cost savings in closing FHMC from which these crisis care centers were to be funded. Developmental Disabilities Administration was able to secure one home in Lakewood which can care for only 3 youth at a time. Since opening this Crisis Care Center (you heard one mother, Janice Laurence, talk about her son’s utilization of this center) in December 2012, 12 youth have been able to access these services. Of those 12, only one was able to return to the family home – all others either went to an RHC or a licensed residential home for youth. 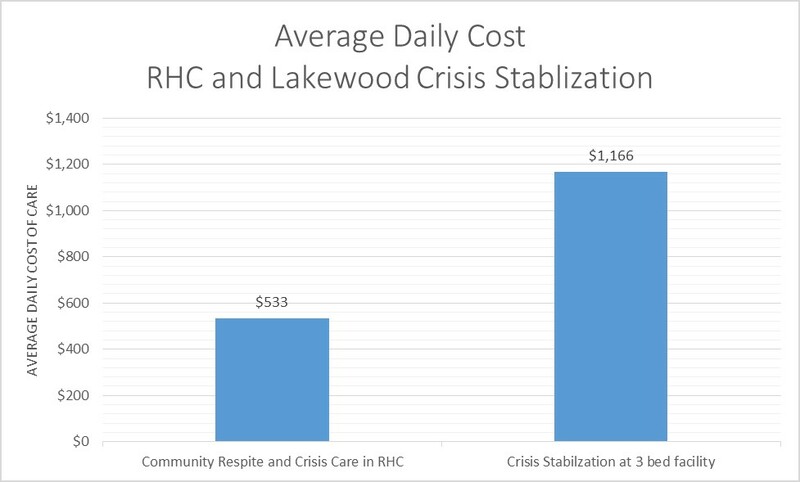 The daily cost of care in the Lakewood Crisis Stabilization is $1,165. Frances Haddon Morgan Center (which today sits empty and unused) was able to care for about 22 respite clients per month for a cost of at a daily rate of $541 (federal and state costs combined) – clearly, utilizing the RHC for much needed respite was not only more cost-effective but much more accessible to our communities in need. Data taken from the Executive Management Information System also clearly indicates how our RHCs serve those in our communities throughout our state. We often hear about the number of “permanent” residents in the RHCs but rarely hear about the much larger numbers of community residents who receive much needed crisis care and respite care. 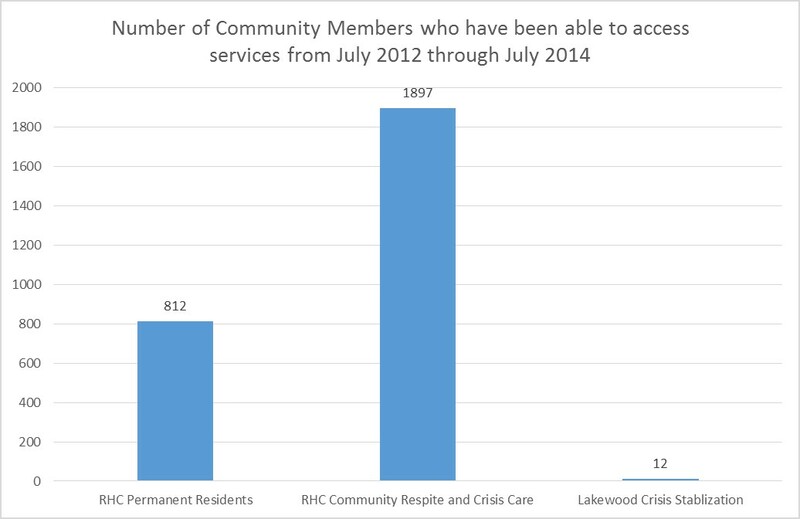 The community members served in our RHCs are more numerous than the numbers of permanent residents served in the RHCs. Also, the RHCs can provide this expert and comprehensive care at 46% of the cost for similar care at the Crisis Stabilization Center in Lakewood. It only makes sense to continue to utilize the facilities we have and use them to capacity to best serve our communities in need. Closing or consolidating our RHCs is not the answer as evidenced by the wasteful “experiment” we have experienced due to passage of 2SSB 5456. Data received from the Department of Social and Health Services, Executive Management Information System with correspondence from Mark Eliason, DSHS Office Chief of Policy and Programs; Janet Adams, DSHS Quality Programs and Stakeholders Office Chief; Carol Kirk, DSHS RHC Program Manager; Monica Reeves, Monica Reeves, Crisis Services Program Manager. In a recent thread in the LinkedIn group “Intellectual Disabilities Support Professionals” there has been a heated “discussion” regarding inclusion. There is one very outspoken and prolific writer who regards anything but independent living supported by his agency as being “groomed for a systems lifestyle” to be “segregated, isolated and warehoused in institutions” He calls himself an advocate but has disdain for anyone one who needs extra supports which may not be available in his type of community. He refers to people who have higher support needs as not having “real lives” because they may live in a supportive community, an intermediate care facility, or group home. He refuses to listen to others and abrasively dismisses any viewpoint other than his own and that of his agency. Needless to say, his writings are tiresome, repetitive, derogatory, one-sided and void of understanding of the complexity of the “real” situation. It’s really a shame because this person is passionate about his advocacy but is unable to see or appreciate alternatives and the fact that the population of people with intellectual disabilities is very heterogeneous. The researchers are now beginning to realize that “one size does not fit all” and most of the research has focused on those who have a fairly good command of language complexities and those who only have a developmental disability not people with intellectual disabilities. My son Thomas is 20 years old and lives in a supportive community which many would call an “institution”. He calls it home. 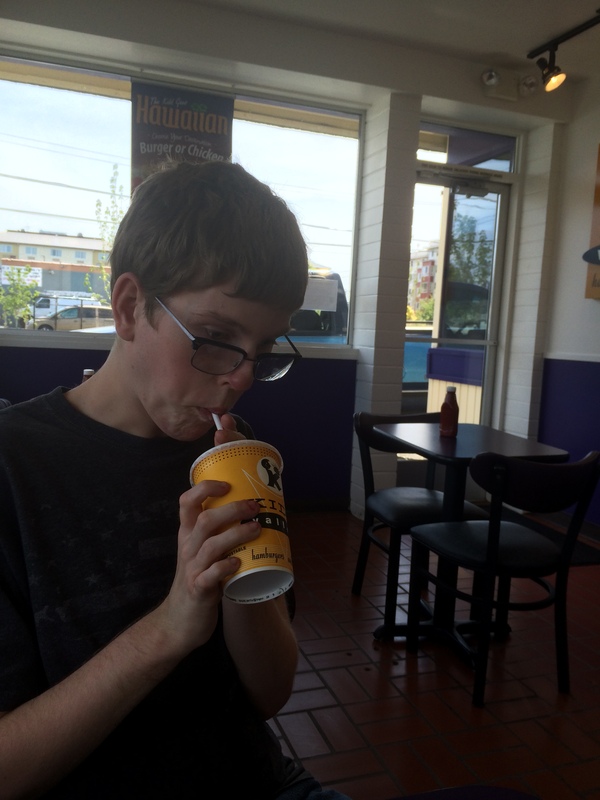 Thomas is very self-determined making many choices which are important to him. He lives in the community in which he grew up and enjoys events all around the region. He is extremely good at planning what he wants to do and filling us all in on the local events around town. He is a wealth of information. 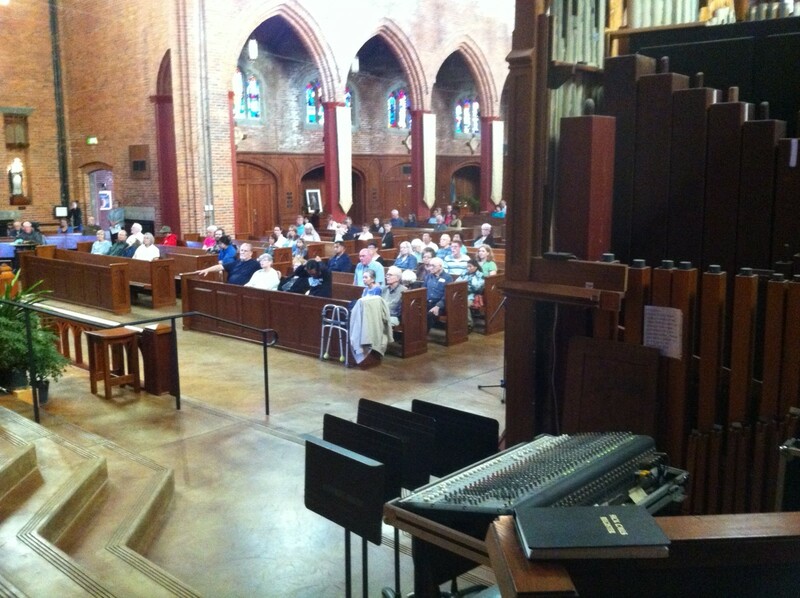 Thomas attends mass weekly at Blessed Sacrament Church in Seattle, Washington. 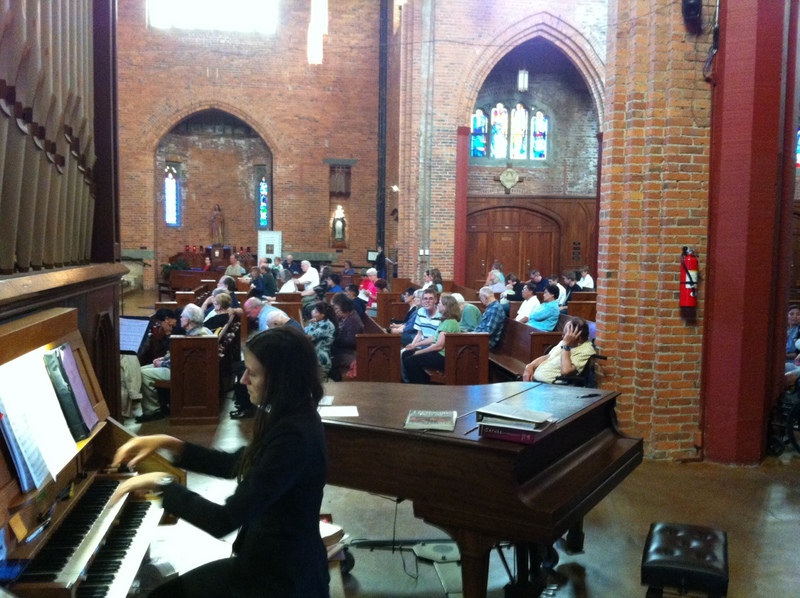 He was baptized in this church and has gone here his whole life. 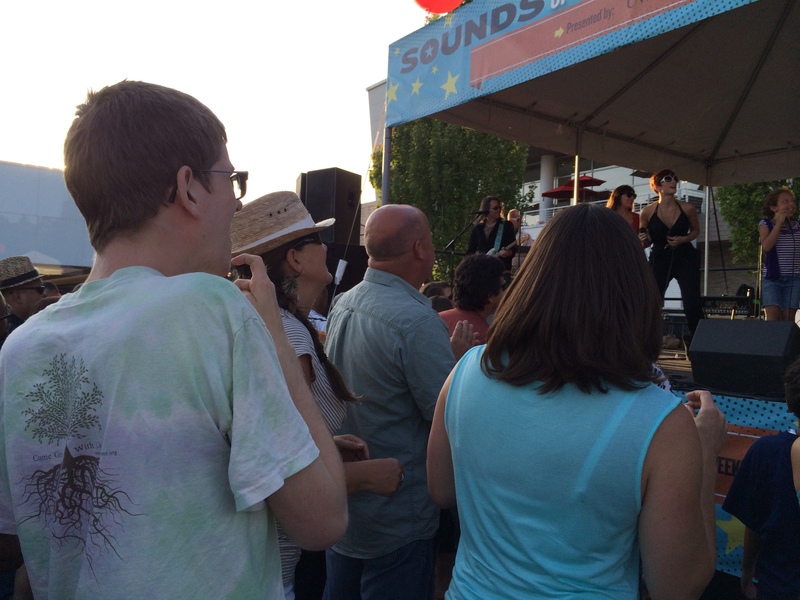 He attended the “Sounds of Summer” concerts at University Village – something he does every summer. 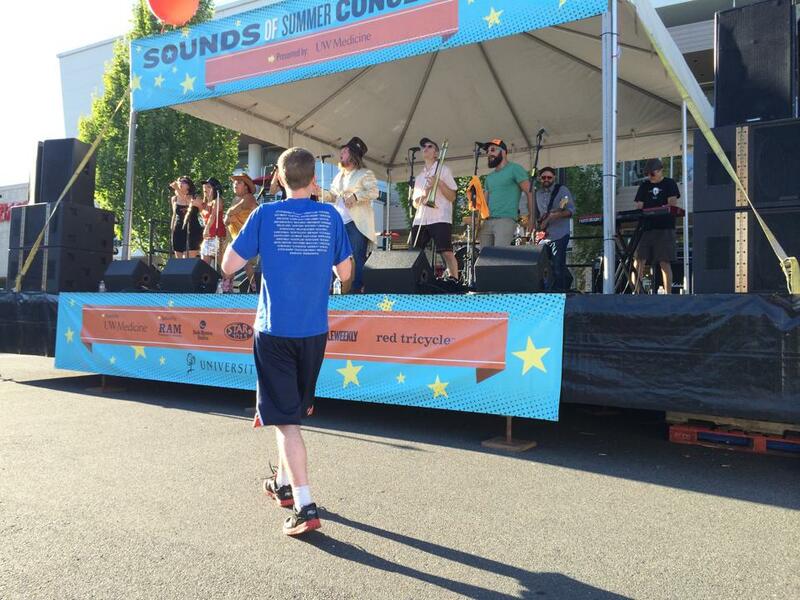 He is well recognized there as he is the first one up to dance and chats with the band members. 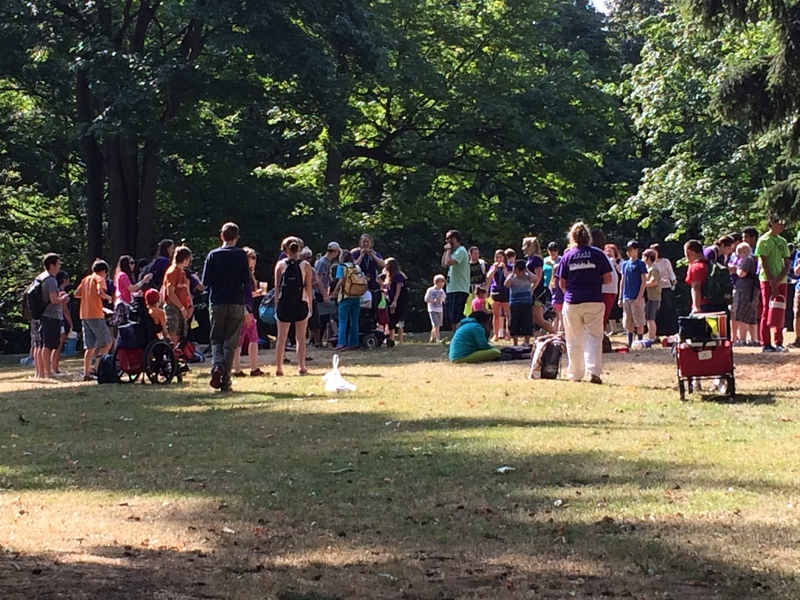 He attended day camp at Woodland Park through the Seattle Parks – another annual favorite! I was a member of the Facebook group “Seattle Disability Community Outreach” until yesterday when I was deleted as a member. I had posted several issues previously and never had a problem and it surprised me that my recent posting “No Room” sparked such militant responses. This brought up the issue that I have often wrestled with – am I an activist or an advocate – some definitions I find of these two words indicate that the words are synonymous but are they really? After reading the comments by some members of the Seattle Disability Community Outreach and a description that they are “disability activists” I know that I am not an activist by their definition. I do not understand their type of “activism” because to me it denies people individualized choices – apparently these activist want to make decisions for everyone based on what these activists believe is right. There is no opportunity for discussion or understanding of various needs. The other issue is the continued referral to the Olmstead decision with regards to institutionalization. I doubt if these people have actually read the U.S. Supreme Court Decision because it does not say to close all institutions – in fact it states that some people will always need that level of care. What Olmstead REALLY says is that people are individuals and they should be allowed their choice – not be forced into what others think they should have – so, in my interpretation of that, these so-called “activists” violate the very decision they think they are quoting. I realize that this group does not advocate for a continuum of needs nor do they as a group realize that people have different support needs and choices. I did write the following letter to the 4 moderators of the group – since I am no longer a member I can not comment and try to respond to those who are so adamant against choice and individual rights. It appears that I have been deleted from “membership” to the Seattle Disability Community Outreach page. There was a posting that I had regarding “no room” which was militantly opposed to by some members. This is such a shame that activists are so dogmatic in their beliefs that they cannot understand that there are a variety of needs and choices. Referring to Olmstead is in fact needed – but it’s also important to know what the Olmstead decision really says – It upholds the civil rights and choices – not denying choices. Nowhere in Olmstead does it say to close institutions either. The fact that a dialogue cannot ensue and the same rhetoric is heard over and over with no accurate data only adds to the violation of rights of our most vulnerable citizens. Maybe the Seattle Disability Community Outreach group does not advocate for those with intellectual disabilities? Yes, I know that many, many people were sent to institutions and many, many people did not need to be there – that does not negate the fact that we still do have people with extremely high support needs who need to be cared for. Some of these do choose to live in a campus community. This in no way means that they are not included in everyday life – in fact many have extremely active social lives on and off campus. Referring to articles of over 20 years ago as “proof” does nothing. There are countless articles about abuse in every setting – but if one did research one would realize that there is much better oversight in supportive communities than in scattered and isolated homes. I’m saddened by the lack of awareness of these members who wrote – maybe they are not aware of the many families in our area who are in crisis trying to care for their young adult children with severe intellectual disabilities – many who also have some form of mental illness. 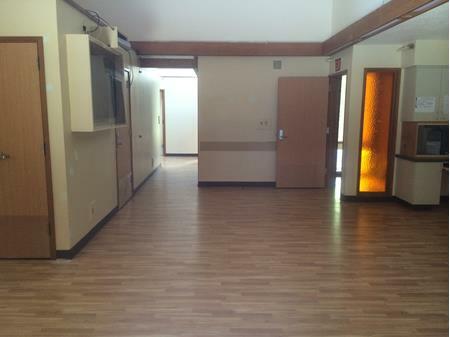 Sure, it would be nice to have their own home and have stable caregivers but our society does not respect these much needed caregivers and the staffing turnover is over 40% in many of these homes. For people who cannot dress themselves, cannot cross a street, cannot be safe without every door and window locked for various reasons and need to have 1:1 or 2:1 staffing to maintain safety without restrictions, sometimes the campus setting is the least restrictive and when people are militant about “community” they do not understand the issues of some or our most vulnerable citizens. As an advocate it upsets me to see others advocate against safe and appropriate care only because the setting was not right for them. It’s time to really uphold the Olmstead decision and allow choice and individual rights and access to safe care. I am sending this to all four of the moderators of this group. Share if you like with the membership. I would be more than glad to share original documents regarding cost of care, safety of care and appropriate care. I wonder why these concepts are violated by the very agency to which they belong and the agency which is there to build and sustain supports for our citizens with intellectual disabilities. 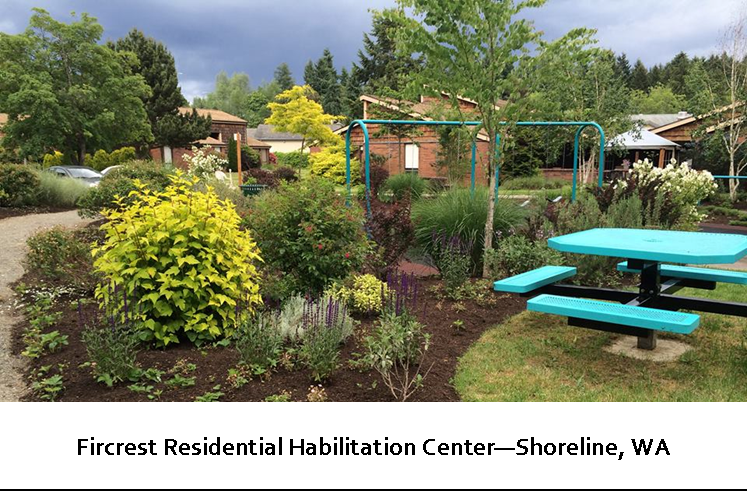 Currently, we have people in crisis in our local community who are eligible for and have requested emergent admission to the local Residential Habilitation Center, Fircrest (RHC). The request was denied based on “no room” and the department is working hard, against the choices of the individual, her family and her guardians, to “divert” her to “community” homes which are not safe or appropriate for her needs or ship her away to the RHCs far from her family and community. 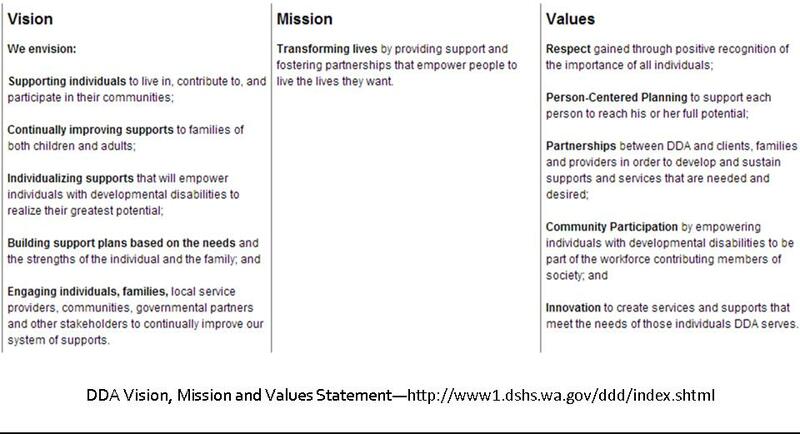 How do these actions fit in with the vision of the department? These actions are not unique to the individual mentioned. This is how the department chooses to manage the choices and requests of those with high support needs who request the supports and services available at the RHCs. We hear that people do not want these supports and services, but this is not the real story of what is happening behind closed doors. 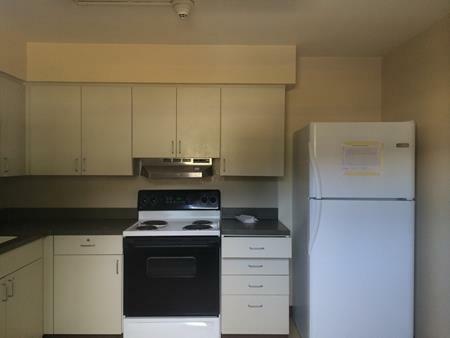 These photos below were taken August 1, 2014 showing a fully remodeled and empty unit which could house up to 16 people who need supports and services. These are at the very RHC which the department states “no room”. If we were allowed to utilize these units on campus we would not only be providing much-needed services to individual and their families but also being good stewards of our public resources. It is simply not true. Please help us utilize the resources we have. By utilizing the resources we have we can help prevent crisis and trauma to people and their families. We can support stability in people’s lives and have sustainable programs – if we were only allowed to do it. The restrictions being forced upon people with intellectual disabilities are limiting their choices by making false assumptions about what people need and want. Help us to hold the Developmental Disabilities Administration accountable to their own Vision, Mission and Values Statements! Please take action before it is too late! Unfortunately, neither of these agencies understand what this means and use a heavy handed, judgmental approach to force people and evict people from their homes of their choice and needs – and they are doing this under the guise of Olmstead. I know that I will be listening in to hear how they rationalize their harmful and draconian actions. 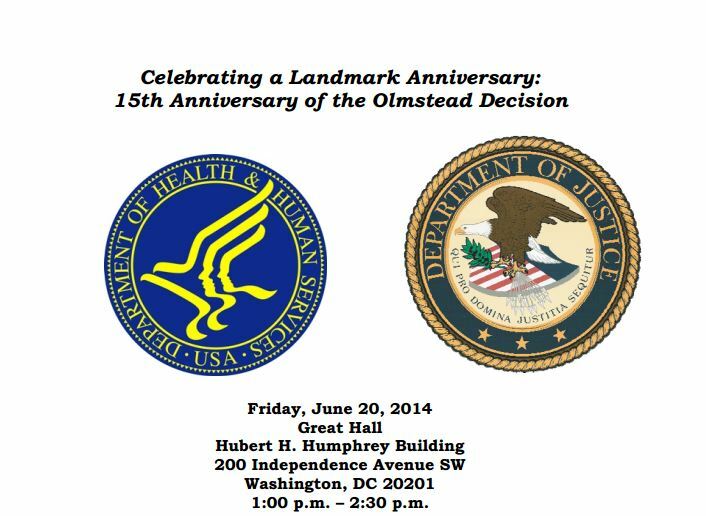 In observance of this important milestone, please join senior officials from the U.S. Department of Health and Human Services (HHS), and the U.S. Department of Justice (DoJ) for a celebration of the Olmstead decision. The event will also feature three panels of speakers on the past, present, and future of Olmstead as well as a screening of a DOJ-HHS video that includes testimonials from people whose lives were changed by the Olmstead decision. Please indicate your response to this invitation by contacting Evelyn Hernandez by email at Evelyn.Hernandez@acl.hhs.gov by June 13th. Registration is required and space is limited. If you have questions please call Evelyn at 202-357-3518. Please call if you require special accommodations. For those not able to attend the event in person, HHS Live will carry the event live at http://www.hhs.gov/live/. 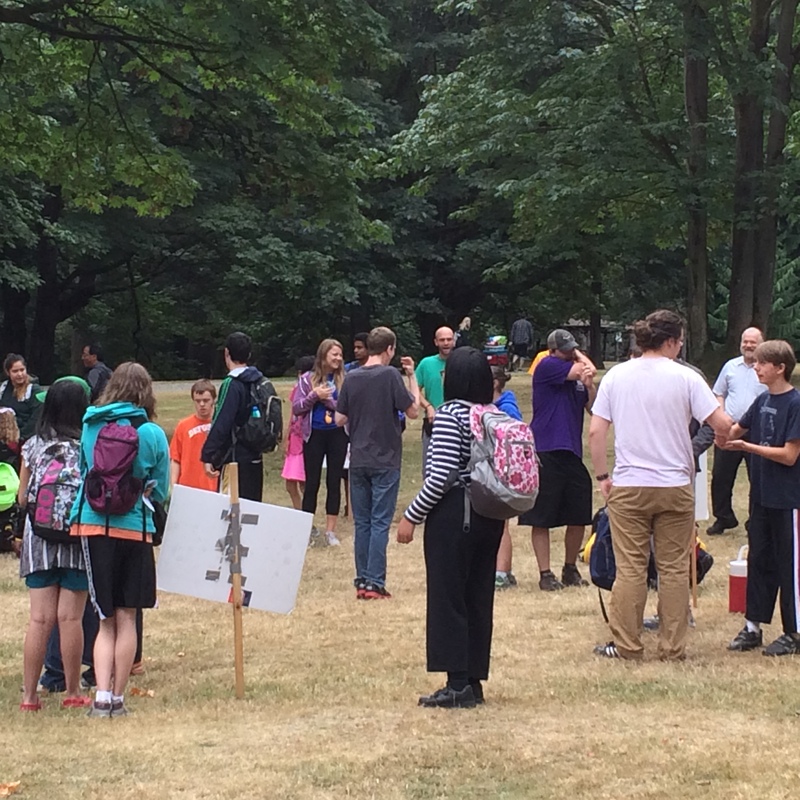 Recently there was a “Proclamation for the Dignity and Rights of All Human Beings” circulated by Allies in Advocacy and Spokane County Parent Coalition. I have real concerns about documents such as this, supposedly written by self-advocates. Self-advocacy is important and empowering but not when it assumes to speak for all. There are so many people with developmental and intellectual disabilities who cannot speak for themselves and who would not agree with or be capable of much of what is written in this document. I would like to know how self-advocates address the issues of those unable to speak, unable to reason, unable to process thoughts in a coherent manner. With self-advocacy even more of our vulnerable loved ones are forgotten.- assuming the self-advocacy groups speak for all people who have developmental disabilities. In addressing these groups I would be so glad to hear how they incorporate the needs, desires and choices of those less able. How do they address choice? How do they address those who leave the choices to their guardians? Just because a guardian is making a decision does not mean that they did not listen or take into account the needs and choices of the individual. Yes, risk taking and the opportunity to fail are important to learning – but as a healthcare professional and guardian, I do believe that there is a fine line between allowing one to fail and allowing one to harm oneself in the process of risk taking. Some people, regardless if you think they are capable of making sound decisions, are not able to do this and do need to have a guardian make decisions for them. This in no way takes away any of the human dignity of the person who needs this support – rather it honors their abilities and inherent dignity. Just as self-advocates do not want people making decisions for them, as a guardian I do not want self-advocates making decisions for my son. My son would not agree with many of the statements in the proclamation and would not understand 99% of what it even says. In complaining about decisions being made for them and how they don’t like things, they make decisions and discriminate against those who are more vulnerable, those who cannot speak for themselves. This seems a little hypocritical to me. Self-advocates say they do not want to be labeled and do not want to be called special, do not want to be perceived as needing anything more than anyone else. I’m curious though, in this line of thinking, without having adaptations and specialized equipment and supports, how would they be able to involved in the community as much as they are? It can’t be both ways. Many people with developmental and intellectual disabilities do need “special” treatments, equipment, supports and adaptations to participate in community life and to have a good quality of life. Why would self-advocates deny this? 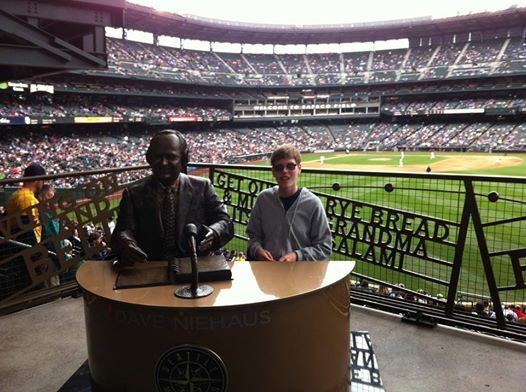 I am so grateful and appreciative of the special attention and supports my son receives. These have enabled him to live a well-adjusted life and be happy. Advocacy does not mean playing the victim and telling others that you deserve something. Advocacy is not complaining about the good that others may receive. Advocacy is not pitting one vulnerable group against another. Advocacy is not placing blame on other populations. Advocacy is not self-centered. Advocacy is working in a collaborative efforts to make things better for all – looking at innovative and constructive systems and methods and being appreciative and thankful for supports. 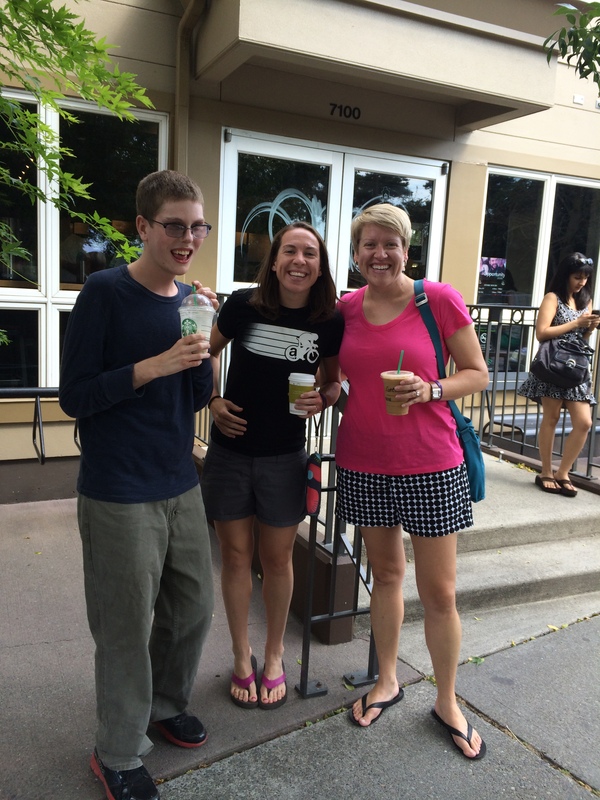 I do not see this happening in the self-advocacy movement – if it is, please let me know.